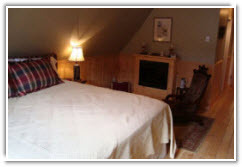 The Castle Inn and Restaurant located in Perth-Andover, New Brunswick, Canada features a number of great rooms available for rent. 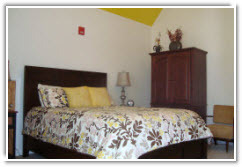 To make a booking, please contact us at 1-506-273-9495 and quote the room name/number and date(s) you require. Please have your credit card number ready. Select a room below for more information. 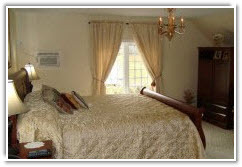 If you should require a cot for an extra guest, please let us know upon booking. 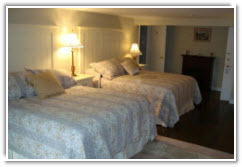 Cots are permitted in select rooms for an additional fee. Located on the second floor, the Royal Suite offers 800 square feet of comfort and old-world elegance in the main part of the building dating back to the 1930s. 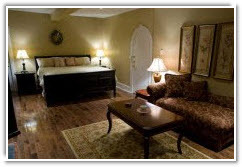 The suite provides a Deluxe King size bed, dining and sitting areas and a fireplace, as well as a shower stall and two-person jet tub in the private bathroom, and plenty of closet space. Located on the second floor, the Victorian Suite is accessible from the back lounge stairs in the original part of the building dating from the 1930s. Spend a quiet, early-morning moment in the sunroom with a steaming cup of coffee, relax in the jet tub with complimentary Lord & Mayfair bath salts, or toast a special day with champagne in front of the fireplace. 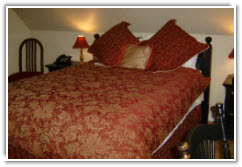 If you’re hoping to escape the stresses of daily life, the Victorian Suite is the perfect spot for you! Located on the third floor of the original part of the building dating to the 1930s, the Regency Room can be accessed via the tower staircase or the back lounge stairs. The room’s large west-facing window offers a view across the St John River valley and offers the perfect location to sit and watch the sun set with a cup of tea from the complimentary in-room facilities. The Regency Room shares this floor with its sister the Empire Room, and the two are ideally situated for a group travelling together. A comfortable room nestled under the sloping eaves on the third floor of the original part of the building dating to the 1930s, the Empire Room is accessible by the back lounge stairs and features a Queen Size bed and remote-control electric fireplace. The Empire Room is a great addition to the Regency Room as they are the only rooms situated on this floor and lend themselves well to families or groups travelling together. Located on the second floor, the Edinburgh Room lies in the newer part of the building that was completed in 2009. A window-facing writing desk offers a rare opportunity to put pen to paper, and amenities such as air conditioning, complimentary in-room coffee and tea making facilities, Lord & Mayfair toiletries, a separate glass shower stall and cable television all contribute to a relaxing, enjoyable stay. The Glamis Room is located on the second floor in the newest part of the building that opened in 2009. Antique furnishings and English cottage-style accents compliment the decor and lend an air of vintage chic to this very comfortable room. A double jet tub and separate glass shower unit are featured in the private bathroom, and room amenities include a Queen Size bed, complimentary in-room coffee and tea making facilities, cable television and DVD player, air conditioning, and Wi-Fi. The Windsor Room is located on the second floor in the newest part of the building that opened in 2009. 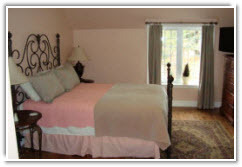 Overlooking the circular drive and garden, this room features a Queen Size bed and is decorated in soothing shades of peach and green. 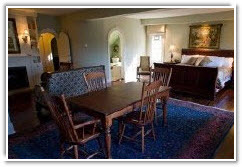 Ideal for a family travelling with older children, this room is connected to its adjacent sister room via independently-locking double doors. The Buckingham Room is located on the second floor of the newest part of the building that opened in 2009 and sits adjacent to the Windsor Room. The two sister rooms are ideal for a family travelling together who would like common space with a degree of independence. 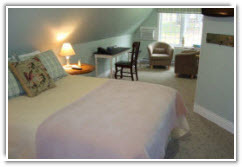 Decorated in tranquil colours and overlooking the circular drive and garden, the room features a Queen Sized bed, cable television and DVD player, in-room coffee and tea making facilities, and air conditioning. The Stirling Room is located on the third floor of the newest part of the building that opened in 2009 and looks out onto the property’s lush old-growth forest. 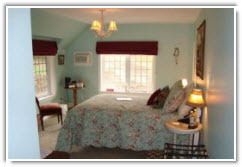 Nestled cosily under the eaves, this tranquil-toned room features a Queen Size bed, desk, and small sitting area. A fantastic room for children, the Stirling Room makes a great add-on for those staying in the Balmoral Room as they are the only two rooms on this level and lie approximately 15 feet away from each-other at opposite ends of a short corridor. Located on the third floor, the Balmoral Room is cozily nestled under the sloping eaves of the newer part of the building completed in 2009. A writing desk and television with DVD player face the King Size bed, with views out across the lush lawn to the old-growth forest beyond. If you’re lucky, catch a glimpse of the resident wildlife and take in the wonder of unspoiled nature from the comfort of your room. Perfect for families, Regal Room features cathedral ceilings and a unique decor—exotic colours and furnishings transport you to a place of lush foliage and sumptuous comfort. There is a separate children’s area that can be accessed via their own wooden stair ladder feature bunk beds and are the perfect hideaway for youngsters. The room lies adjacent to the indoor pool area for convenience. 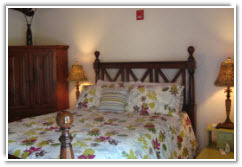 The room feature flat screen cable TV, air conditioning, private bathrooms, and access to a small deck. Perfect for families, Renaissance Room features cathedral ceilings and a unique decor—exotic colours and furnishings transport you to a place of lush foliage and sumptuous comfort. There is a separate children’s area that can be accessed via their own wooden stair ladder feature bunk beds and are the perfect hideaway for youngsters. The room lies adjacent to the indoor pool area for convenience. 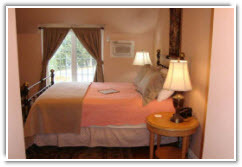 The room feature flat screen cable TV, air conditioning, private bathrooms, and access to a small deck. Contact us at 1-506-273-9495 for reservations or more information about The Castle Inn and Restaurant.